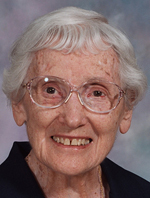 Sister Rosa Carmichael, O.S.F., died March 19 in Assisi House, Aston. She was 94. She had been a professed member of the Sisters of St. Francis of Philadelphia for 70 years. Sister Rosa (Anne Veronica Carmichael) was born in Philadelphia where she was a member of Corpus Christi Parish and a graduate of John W. Hallahan Catholic Girls’ High School. She entered the congregation in 1943 and professed her first vows in 1946. Her sister, Sister Mary Teresa Carmichael, also entered the congregation at the same time and currently resides in Assisi House. Sister Rosa studied nursing at St. Joseph Hospital in Baltimore where she became a registered nurse. She later earned a B.S. in nursing from the Catholic University of America and an M.S. in nursing education/administration from St. John University. She ministered primarily in health care. During her 43 years of ministry in the Archdiocese of Philadelphia, Sister Rosa worked at Neumann University as an instructor in the Nursing Department. After her retirement she served in local house ministry at Our Lady of Angels Convent in Aston. In 2012 she moved to Assisi House where she served in prayer ministry until her death. Sister Rosa also ministered in the Diocese of Wilmington for 18 years at St. Francis Hospital as a head nurse and supervisor. She was also an instructor in St. Francis Hospital School of Nursing and later the director of nursing. Sister Rosa also ministered in health care in the Diocese of Allentown. Her funeral Mass will be celebrated at 11 a.m. March 23, preceded by a viewing, at Assisi House, 600 Red Hill Road, Aston. Burial will follow in Our Lady of Angels Cemetery in Aston. In addition to Sister Mary Teresa, Sister Rosa is survived by many cousins and by her Franciscan family.